For more than 20 years, Instru-Safe® instrument protection trays from Summit Medical have been used to protect delicate surgical instruments as well as camera heads, scopes and light cables during sterilization and transportation. They are high quality perforated metal trays with medical grade silicon instrument cushions, and are specially designed for an extensive range of applications including ENT, Neuro, GS, Ortho etc. 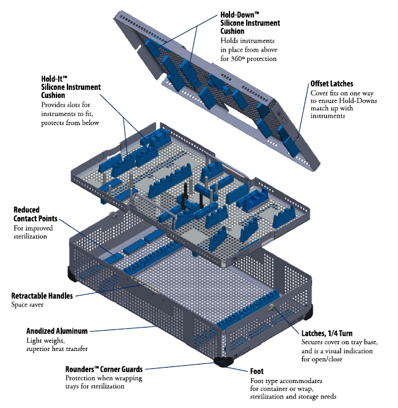 Customers may choose from options such as Rounders™ corner guards and foot types, or even customize trays to their individual requirements. Instru-safe® trays provide exceptional durability for long term cost-savings. Stryker’s instrument protection trays protect delicate surgical instruments as well as camera heads, scopes and light cables during sterilization and transportation. They are high quality perforated metal trays with medical grade silicon instrument cushions, and are specially designed for an extensive range of applications including ENT, Neuro, GS, Ortho etc. They provide exceptional durability for long term cost-savings.